I offer a professional garden design and landscaping service catering for all types of garden space, from small town courtyards to large rural gardens. 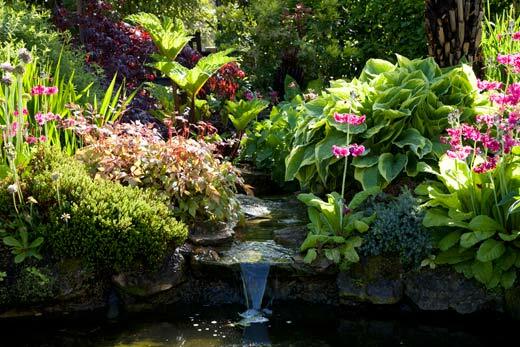 Based between Doncaster and Sheffield in South Yorkshire, we also offer a garden advice service. We can discuss problem areas of the garden, planting, design, garden features etc. Recommended by Dukeries Garden Centre, Worksop. For examples of recent Commissions, including National Health Service and Amenity projects, please see our gallery page. Decking looks impressive, especially when first erected. But be aware that, unless you live in the dry areas of southern England, your lovely new decking will soon become extremely slippery, and will require regular maintenance. Pebbles are round and will not lock together to provide a stable surface. Gravel is angular and fits together. Over time and use, gravel provides a more compact surface to walk on. Both aggregates shouldn’t be used on a slope as they will move downhill and require regular dragging back up, depending on the angle of the slope. Small gravel and pebbles should be avoided as both will get trodden into the tread of shoes and be transported indoors. Another drawback is that cats may use small aggregates as a toilet. Don’t underestimate the visual impact of a lawn. Grass provides a soft green surface all year round. As long as you have the time to maintain a lawn, you will enjoy the benefits in both visual and recreational ways.